If you have an unstable income, one of your biggest challenges is to develop ways to smooth out your cash flow and make your finances more consistent. This can be an issue if you are self-employed, or rely on a significant amount of commission or bonus income as part of your overall compensation. Your cash flow can be high one month, but fall off a cliff in the next. The challenge is to even out your income, so that you are not flush one month, but then pinching pennies the next. Here are some suggestions on how you can do that. In every household budget, there is necessary spending, and optional spending. These can be easy to balance in months when your cash flow is high. But if you find yourself with a windfall one month, then breaking open the piggy banks for the next two or three, you could be putting yourself under substantial financial pressure. The best way to handle this is to keep your basic spending at the low. That means that your necessary expenses – your house payment, utilities, insurance, and debt payments – need to be as low as possible. If for example, your income ranges from $2,000 per month to $5,000 per month in the same year, your basic living expenses should be no more than $2,000. That will enable you to survive in your lowest income months. In the months when your income is on the high side, you should bank the difference so that you will have money available when your income isn’t as generous. 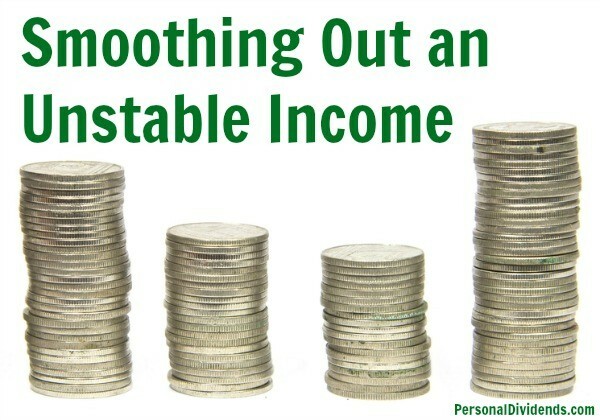 When your income fluctuates, it often helps to have an additional income source to even out ups and downs. A part-time job can help do this, since it will most likely involve a fixed number of hours as well as a fixed level of compensation. The stability of the part-time job income will at least partially offset the wide swings in your primary income. Many people who are self-employed or work on commission do part-time work when their incomes are relatively low. But if you maintain a part-time job year-round, this might not only help to even out your income flow, but it may also keep you out of the position of always being desperate for income in the slow months. Another additional income source that could work especially well with self-employment is doing contract work. Let’s say that your primary business is not producing a sufficient amount of income to pay all of your expenses in some months. You can make up the income deficiency by doing contract work for another company in the same business. Though large companies will often prohibit you from doing contract work for them since you are also one of their competitors, it is often possible to find such work with other small businesses. You can take contract work either on a steady basis, or on an as-needed basis. Either will provide you with the extra income source that will help to smooth out your income flow. Earlier we talked about saving the money from your high income months, to cover you during the low income months. A better approach will be to bank at least some of that money in semi-permanent savings, such as a savings account. Once you get to the point where you have a sufficient amount of money saved to cover several months living expenses, your cash flow issues largely disappear. Anytime you’re short in one month, you can take money out of the savings account to cover your deficiency. If you use this method to smooth out your income, it will be critical that you have a plan to replace the money used on an ongoing basis. It will be a balancing act to make sure that you constantly replenish your savings account in the high income months. In fact, you’ll have to be virtually religious about doing this. In a perfect execution, your savings account will grow from year to year, even though you’re making periodic withdrawals during low income months. Whatever method you choose, be sure you do what is necessary to even out your income flow. Not only will that help you to survive, but it will also help you to do your job or run your business more efficiently. Money concerns can cause you to lose focus in doing your work, and that can sabotage your business. Evening out your cash flow is one of the best strategies for improving your business.